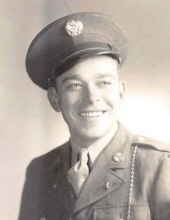 Dallas W. Presnell, 98, of Pana passed away Sunday, April 14, 2019 in Heritage Health—Pana. He was born February 14, 1921 in Oconee, son of the late Jacob Elmer & Maude (Wright) Presnell. Dallas married Madelayne Degand in 1946 and she preceded him in death on September 20, 1994. Dallas served in the Army Air Corp. and then owned and operated PBI Redi-Mix Trucking in Pana. He was also a member of the First Baptist Church, Pana. Dallas had a great singing voice and had a hundred “sayings”. He didn’t know a stranger and always had good, grounded advice to give. He was a kind & gentle man with a twinkle in his blue eyes. Dallas was a great husband & father and always a provided for his family. He loved his children very much; always patient and his children knew they could always go to him. Dallas is survived by his children: Rena Goode, Sullivan, IN; John Presnell, Springfield, IL; Mara (Jim) Randolph, Pana, IL; Barb (Joe) Perry, Tuscola, IL; Randy Presnell, Pana, IL; grandchildren: Greg (Leslie) Goode, Sean (Christa) Goode, Jill (Paul) Jones, Kelli (Matt) Kessler, Nicholas (Kerra) Presnell, Haley Presnell, Marissa (Allen) Kile; great grandchildren: Jackson Goode, Cecelia Goode, Sophia Goode, Carmella Goode, Christian Goode, Camden Kessler, Grace Kessler, Sadie Kessler, Jack Dallas Kessler, Niko Akiyama, Adalyn Akiyama, Hudson Presnell, Dallas Kile and numerous nieces & nephews. He was also preceded by his son-in-law, Galen Goode and siblings: Frank Presnell, Louvella Presnell, Ora “Pete” Presnell, Lawrence Presnell, Dorothy Allen, Martin Presnell, Harvey Presnell. Funeral services will be held Thursday, April 18, 2019 in McCracken-Dean Funeral Home at 11:00 a.m. with Pastor Nat Kealen officiating. Burial will be in Mound Cemetery, Pana with military rites by Pana Veterans Honor Guard. Visitation will be Thursday from 10:00 a.m. until service time in the funeral home. In lieu of flowers, memorials may be made to the Parkinson’s Foundation, 200 SE 1st Street, Suite 800, Miami, FL 33131 or First Baptist Church, 114 Maple St., Pana, IL 62557. "Email Address" would like to share the life celebration of Dallas W. Presnell. Click on the "link" to go to share a favorite memory or leave a condolence message for the family.